Location: Kunming Changshui International Airport lies nearby Changshui Village, Guandu District in the northeast of Kunming city and is 25 kilometers (about 15.5 miles) from the city center. Brief Intro: The airport was formally come into operation on June 28th, 2012. It replaced the former Wujiaba International Airport and serves as 'Gateway' to southwest China. The new airport services Southeast Asia, South Asia, West Asia, and connects with Europe, Asia, and Africa. It has a layout of about 22.97 square kilometers (8.87 square miles). It has 2 runways and is expected to meet the annual throughput of 38,000,000 passengers, cargo throughput of 950,000 tons, and 303,000 aircraft sorties in the near future. 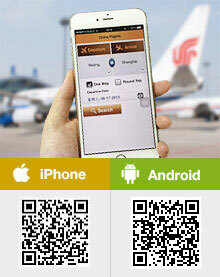 It provides flights to many cities in China and abroad. Some of the domestic cities are popular tourist sites like Lijiang, Jinghong, Beijing, Chengdu, Guilin, Lhasa, Shanghai, Sanya and Xi'an. The international destinations include Taoyuan, Hong Kong, Kuala Lumpur, Seoul, Hanoi, Dacca, Phnom Penh, Osaka, Singapore, Calcutta, Rangoon, Mandalay, Vientiane and Bangkok. Passport holders of 53 countries and regions can enjoy the 144-Hour Visa-Free Policy when making an international transfer via Changshui Airport. Read details about 144-Hour Visa-Free Transit in Kunming. Currently, it has one terminal building, Terminal 1. Terminal 2 is expected to be completed before 2020. The total building area is about 548,300 square metres, which is the second largest terminal building in the country only next to Terminal 3 of Beijing Capital International Airport. The building has 3 underground floors, as well as 3 floors above ground. It has 66 contact gates with jet bridges. Advanced and complete facilities and services are available in the building for transit, shopping, dinning, accommodation, and entertainment. 1.Both domestic and international check-in counters are closed 30 minutes before flights departures. 2. Passengers should arrive 2 hours in advance for domestic flights and 3 hours in advance for international flights. The Transfer Hall provides passengers with baggage tag-through service and air ticket, boarding pass exchange and luggage consignation service. This transfer service is only applicable to passenger transfers between domestic flights. When buying an air ticket, passengers should note that at least 2 hours must be reserved for transfer. It is easy for passengers to take subway, airport shuttle bus, or taxi to travel between the airport and the downtown city area. Commercial Area: The commercial district of the airport has been divided into six different areas, with a total area of 35,000 square meters. Ninety-eight companies have started operation, including 61 retail outlets and 37 catering shops. Snack bars, coffee shops, banks, and post offices are also available. First Aid Room: There are 3 first aid rooms in the terminal building, providing medical treatment for passengers. They are located separately at the west side of the security inspection area in the Domestic Departure Hall on F3, Boarding Exit 30 at the arrival alleyway on F2 at east airside concourse Y, and the administrative area on F2. Lounge: There are 40 hourly lounges in the airport, providing shower, rest, and other services. Passengers can find them at the area of the International Departure Hall and Domestic Departure Hall on F2. Children Playrooms: Two children’s playrooms are set in the terminal building. They can be found at the commercial area of the Domestic Departure Hall, and International Departure Hall on F2 at the front center area. Car Parks: There are two parking lots, inside and outside. Inside: CNY8 for first 60 minutes, CNY2 for every 30 minutes afterwards and CNY60 for one day. Outside: CNY5 for first 60 minutes and CNY1 for every 30 minutes afterwards; CNY60 for one day for small-sized vehicles and CNY100 for one day for large-sized vehicles. Tip: It is free to park a vehicle for less than 15 minutes. Airport Inquiry: There are 15 inquiry desks in total in the terminal. They are located separately at the Departure Hall, security inspection area of the Domestic Departure Hall, commercial area at the middle airside concourse of the Departure Hall on F3; the commercial area of the International Departure Hall on F2; and the Greeting Guests Hall on Base 1. Luggage Storage: The luggage storage service is available at the air crew and employees aisle at the west side of the Departure Hall on F3, and Domestic Exit at the west side of the Greeting Guest Hall on Base 1. Luggage Packing: Four luggage packing service counters are available at the Departure Hall on F3 in the terminal building. Lost & Found: Lost & Found service is provided at each inquiry desks in the terminal. Bank: There are banks, ATMS and Agiotage Services in the terminal building. WiFi: The passenger active area in the terminal is covered entirely with WiFi service. Transit Visa required for Indian national? I am Indian citizen and I will travel from Incheon to Kolkata via Kunming. I have a layover time of 3.5 hours and I will be inside airport. Kindly respond at the earliest so that I can book my flight accordingly. Is there a service for people can't walk so well from check in to the boarding gate und for domestic flights to CUN must take the bus to the airplane or is there any help? Does anyone speak english at the Kunming International Airport? How does WIFI work at the airport? I heard that WIFI for android phone doesn't work. Is it correct? Yes, some staff can speak English. It is available but the network speed is not very fast. is there bank of china atm at kunming airport? i dont have rmb with me currently , is there any bank of china atm at Changshui airport so that i can withdraw cash from there since i have to catch a metro which will be closed within few hours ? Sorry, I can only find China Citic Bank ATM at F3. Upon landing, it won't be difficult for you to find it based on the detailed English signs at the airport. I will arrive Kunming at 1.30am. Is there a place to sleep for few hours before morning? I need to catch at train at 9.15 am at KM Railway station. what is the best arrangement? Don't worry. There are hourly rooms inside the terminal building. You can take some rest there. Upon landing, you can easily find the place based on the detailed English signs at the airport.